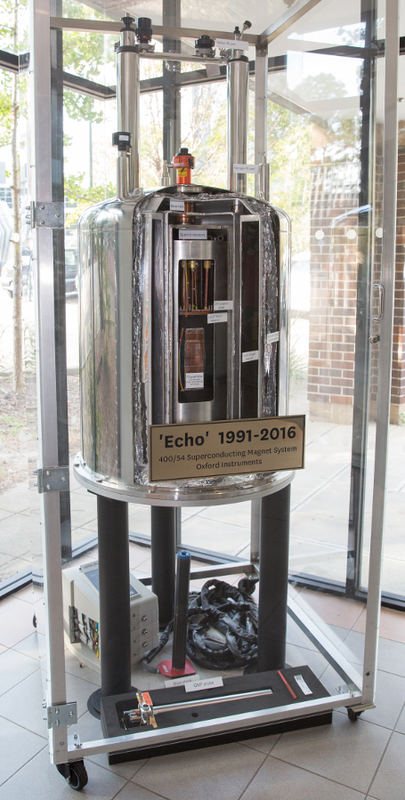 On Friday 12 August 2016 the Facility's original Oxford Instruments 400 MHz superconducting magnet was quenched in preparation for the arrival of the new Ascend series magnet. After being quenched, the magnet was relocated to the Macquarie Engineering and Technical Services (METS) workshop where Sam Borg began the painstaking process of stripping back the cryostat layers to reveal the internal structure. Once the dissection was completed, Sam created a Perspex display case and Dave Frame applied the finishing touches in the form of labels and a commemorative plaque.